when i first heard about new super mario bros. 2 for 3DS i was disappointed, to say the least. nintendo has gotten particularly conservative with their flagship series, and the presentation, including the visuals, enemies, settings, and music, looked identical to NSMB wii, a game that itself wasn’t much of an evolution beyond the first NSMB game (for DS). i went into the game extremely reluctantly, but the game turned out much better than i expected. the game’s gimmick is its focus on collecting coins, and the handful of new items (gold flower, gold rings, gold blocks, etc.) provide a fun diversion and the gold flower in particular leads to nice, rampant, and lucrative destruction not dissimilar to suddenly getting a machine gun in a FPS. but it’s the core gameplay that makes the game worthwhile, and somehow the creators have come up with new courses that are consistently interesting and high quality and have a good amount of variety. 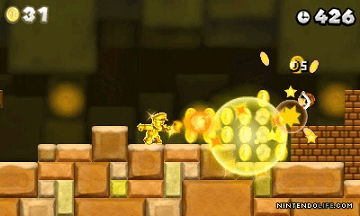 they achieve this in part by focusing a bit more on some of the series’ lesser-used mechanics such as the green moving blocks and mini-boss battles featuring reznor the triceratops (last seen in super mario world), although the amount of actually all-new content is minimal and usually not that interesting (e.g. the auto-dashing cannon levels). there’s also a much greater emphasis on secrets, and although some of the hidden star coins and exits are gratuitously difficult to find, in general they’re fairly worthwhile and add to the experience, especially since in searching for one secret you often come across others. although i usually hate speed runs the streetpass mode was more fun than i expected since it’s not just a straight time attack mode but requires you to balance collecting coins with zipping through the level, and the inclusion of a complete co-op mode was nice although i didn’t use it (although it would be annoying to only be able to make progress in the host person’s game). despite being fun, the game feels very, very safe. boss battles are fairly dull; the tanooki suit is conspicuously missing; and the over-familiarity of the setting and game mechanics tangibly lessens the uniqueness and memorability of the experience. although i enjoyed the game, this game really hits the limit in my interest in another NSMB title. three has been plenty, and i’m really not looking forward to the wii u version, which looks like even more of the same. i really hope the next 2-d title has more true creativity instead of variations on a theme as this one does, but it looks like i’ll have to wait for the one after the wii u game. this one barely managed to keep my interest in the series, and i can’t imagine another game with the same core gameplay, not to mention look, music, and powerups, sustaining my interest. maybe i’ll be pleasantly surprised, but i’m definitely not going to be picking up the wii u just to play the newest mario game.